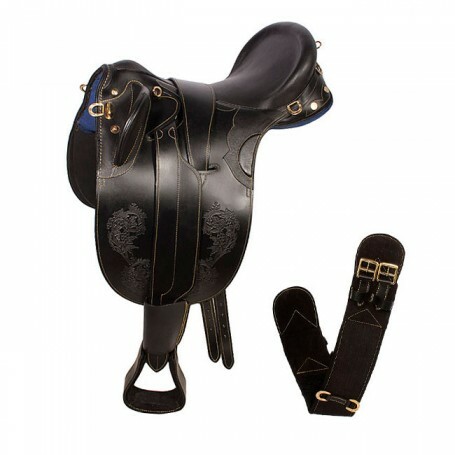 Up for sale is a beautiful hand crafted black Australian saddle. This saddle is specially designed to fit most horses with its new and innovated stuffed wool panels that form to the horses back. The saddle features a deep seat for added comfort. The saddle is made with soft supple drum dried leather and all brass hardware. The saddle has amazing embossing which goes around the border of the double sided flap and brings out the beauty of the leather. The saddle comes complete with stirrups, over girth and under girth. Medium-Wide Tree 6.5" Gullet. Will fit most Quarter horses. Overall I am very pleased with this saddle. It is very comfortable, looks amazing, and with the stuffed wool paneling it fits my horse"s back very well. A couple of things I wish I would have known when I bought the saddle though are that the stirrup leathers aren"t adjustable, and that the girth only comes in one size (36"), which is too small for my horse (a 14 hand QH). I will have to buy a longer girth, and replace the stirrup leathers (I"m 5"3"). Neither of those will be expensive though, so like I said overall I really am pleased with this saddle. I love this saddle. It is comfortable and fits my Friesian Sporthorse very well. The saddle is very beauiful and fulfills my trail riding demands.